Rare Floor Plan Coming Available at Shadow Lake Square! | Robert Hancock Co.
Rare Floor Plan Coming Available at Shadow Lake Square! 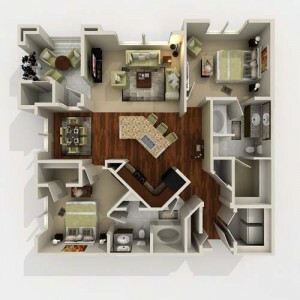 We currently have a our Jefferson floor plan apartment that is waiting to be your new home! This unit has 2 bedrooms, 2 full bathrooms, and storage beyond your wildest dreams. The beautifully open design of the kitchen, with its gleaming granite countertops and naturally lit dining area, make for the perfect setting of family dinners. Refrigerator, glass top stove, microwave, dishwasher, garbage disposal, and full-sized washer and dryer are all included. This apartment is on the 1st floor, shares no walls with neighbors, and has a rather large patio area. Close walking distance to the clubhouse, fitness center, pool, and lake make this unit located perfectly. If the 1st floor is not your first choice, contact us anyhow and see what else we have available!